A host of special molecules called nuclear RNA-binding proteins (RBPs), when misplaced outside the nucleus, form the harmful clumps seen in several brain disorders, including frontotemporal dementia (FTD) and amyotrophic lateral sclerosis (ALS). "Clumps that form from these disease proteins are composed of sticky fibrils that damage nerve cells," said James Shorter, PhD, an associate professor of Biochemistry and Biophysics in the Perelman School of Medicine at the University of Pennsylvania. "We want to reverse the formation of these clumps and put the RNA-binding proteins back in their proper place, inside the nucleus." Normally, nuclear-import receptors (NIRs) bind to specific sequences of amino acids on the RBPs, to shepherd them into the nucleus. 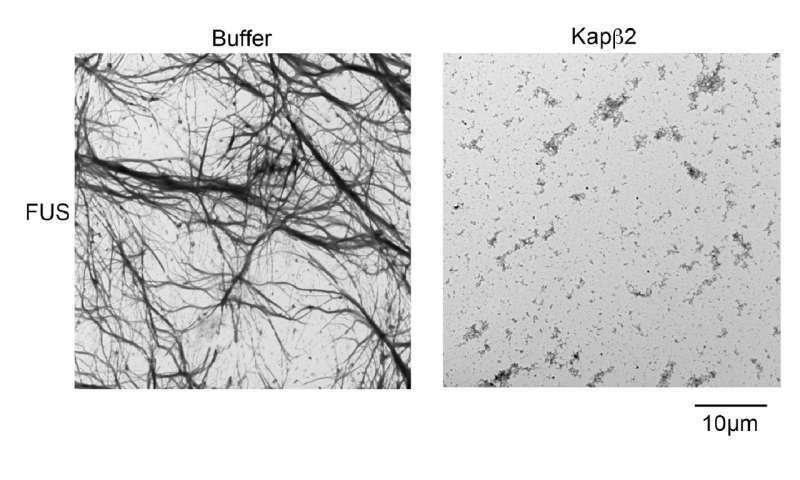 A team led by Shorter, describes in Cell this week what happened when they added NIRs to aggregates made from TDP-43 and FUS proteins, which are connected to these neurodegenerative diseases. "When we increased the concentration of NIRs, there were three important and surprising outcomes," said co-first author Lin Guo, PhD, a Target ALS Springboard Fellow. First, clumps of RBPs dissolved in test-tube experiments. Next, NIRs also dissolved cytoplasmic clumps in cells and functional RBPs were returned to the nucleus. And finally, when the expression of NIRs was increased in fruitfly models of disease, lifespan was extended and degeneration was reduced. "All of this biochemistry was highly unanticipated," said co-first author Henry Wang, an MD/PhD student at Penn. "We didn't suspect that the NIRs would break up the clumps, return the RBPs to the nucleus, and mitigate neurodegeneration." The team was surprised by how rapidly the NIRs could reverse the formation of the FUS and TDP-43 clumps. The transition from the RBP being dissolved in solution to forming droplet-like structures normally happens in the nucleus as a regular part of RBP function. However, when RBPs, like FUS and TDP-43, are misplaced in the cytoplasm, these phase changes can become aberrant, setting the RBPs on a destructive path, which can be corrected with NIRs. But, NIR expression or activity likely becomes reduced in disease. 'Given this complexity, we are now working to find a way to increase expression or activity of NIRs in neurons with clumps using protein engineering or small-molecule drugs, said coauthor Charlotte Fare, a doctoral student in Shorter's lab.